This appetizer is simplicity itself. 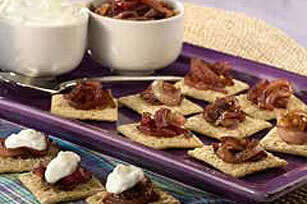 Top woven wheat crackers with balsamic-infused red onions and serve with sour cream. Heat oil in large skillet on medium heat. Add onions; cook 10 min. or until tender, stirring frequently. Stir in vinegar; cook 1 to 2 min. or until vinegar is evaporated. Cool. Top crackers with onion mixture and sour cream just before serving. For a heartier appetizer, top each cracker with a slice of leftover grilled steak before covering with the onion mixture and sour cream. When taking this zesty onion topper to a party, be sure to keep the onion mixture and sour cream in an insulated cooler packed with plenty of ice or frozen gel packs. Top crackers with onion mixture and sour cream as directed after you arrive at the party.